You don’t make a photograph just with a camera. You bring to the act of photography all the pictures you have seen, the books you have read, the music you have heard, the people you have loved. This picture was taken on a very cold night under a full moon around midnight. It was the day when we lost our beloved four legged companion “Shirkhan” , our male cat, to the eternal hunting grounds. My wife and I couldn’t really settle for sleep and decided to take a drive when suddenly the sky exploded above us, with one of the most beautiful Northern Lights we have be lucky to experience until then. My wife decided to name this picture “Shirkhan” in memory of our furry friend. Norse mythology- during every battle, odin would decide which warrior would die and join him in Valhalla. After their deat, they would be carried by the Valkyries to Odin and it is the reflection of the shining armor of these Valkyries that create the Northern Lights. Now in Sweden fishermen beileved that it was huge schools of hering who caused them and seeing them was a good omen! This is a typical norwegain boathouse of nowadays called “Naust”. Traditionally they were build with stone walls and timber roofs. One of the rare occassions when the Northern Lights aren’t only green but purple aswell! 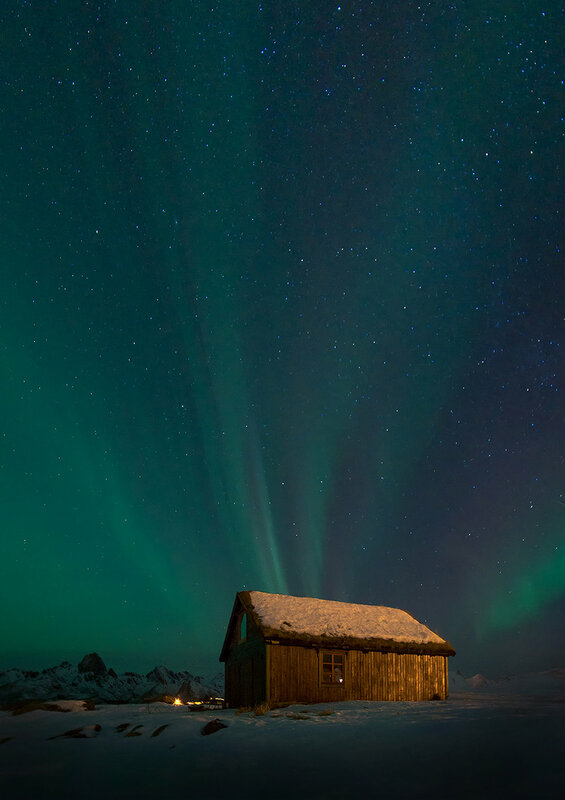 Is a small stunning little costal village in the Vesterålen Archipelago and has been an important center for cod fishing back in the 18th century. Today it is a popular place for artists and photographers but also for hikers.